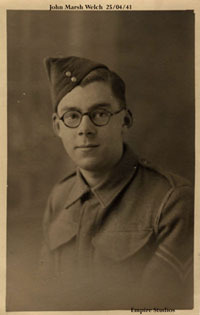 In 1941 during the height of the Blitz, John Welch 7630568 was an 18 year old corporal serving with the Royal Army Ordanance Corps (RAOC) at Hilsea barracks in Portsmouth. 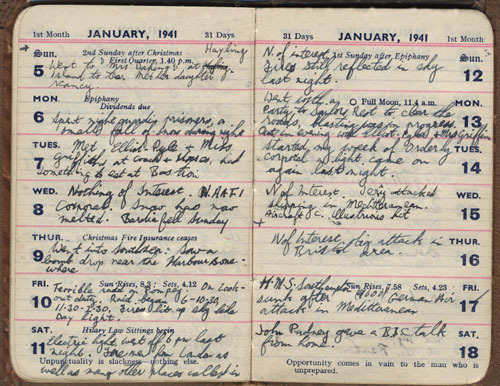 Shown below are his diary entries for the week commencing 5th of January 1941, the week of one of the biggest air raids on Portsmouth. The documents and picture are courtesy of Penelope Welch, his daughter. Thank you for allowing us to reproduce them here. Went to Mrs Daking's at Hayling Island to tea, met her daughter Nancy. Monday 6th January 1941. Epithany. Spent night guarding prisoners, a small fall of snow during night. Met Elliot Pyle and Mrs Griffin at Coach and Horses, had something to eat at Bastion. Wednesday 8th January 1941. Nothing of interest. NAFFI corporal. Snow has now melted. Bavaria fell Sunday. Thursday 9th January 1941. Christmas fire insurance ceases. Went into Southsea. saw a bomb drop near the harbour somewhere. Saturday 11th January 1941. Hilary Law Sittings begin. Electric light went off 6pm last night. Fire crew from London as well as many other places called in. Footnote:- Unpunctuality is slackness - nothing else. Sunday 12th January 1941. 1st Sunday after Epitahny. Nothing of interest. Fires still reflected in sky last night. Monday 13th January 1941. Full moon 11.4am. Went with a party to Sailors Rest to clear the roads, blasting was in progress. Out in evening with Elliot Pyle and Mrs Griffin. Started my week of orderly corporal, light came on again last night. Nothing of interest. Jerry attacked shipping in Mediterranean. Aircraft carrier Illustrious hit. Footnote:- Opportunity comes in vain to the man who is unprepared. 1. Text shown in italics, is the pre printed text in the diary. 2. On the 10th January 1941, 171 people were killed and 430 injured in the air raid on Portsmouth. 3. On 16th January an eleven hour raid caused severe destruction in Bristol and Avonmouth. 4. HMS Southampton was a cruiser hit by 2 delayed action bombs dropped by JU 87s in the Sicilian Narrows. The ship had to be abandoned & was sunk by torpedoes from HMS Orion & Gloucester 11 January 1941. 5. John Sleigh Pudney (January 19, 1909 - November 10, 1977) was a British journalist and writer. He was known for short stories, poetry, non-fiction and children's fiction (including the Hartwarp books).